The best piece of political fiction in modern America is still Bill Clinton. Much of the narrative he wrote himself, but a deeply embedded national media distributed it widely and made sure that reality didn’t intrude too much. The tale began in Hope, Arkansas. As Clinton said when first nominated, “I still believe in a place called Hope.” The National Park Service would eventually give his birthplace official landmark status. And everyone knows about Hope. What they don’t know is that when he was seven, Bill and his mother moved to Hot Springs. Hot Springs would become the first of innumerable deletions or brush overs from the official Clinton story, but it came back to mind the other day when a memoir by Dora Maxine Temple Jones arrived on my desk. It was a 2008 edition of a book originally published in 1983, when Clinton was still a young politician. Dora Maxine Temple Jones was already ill and past her prime as Clinton got started. Nonetheless, the book will tell you more about the real Bill Clinton and where he came from then most of the hundreds of thousands of words that have been devoted to the topic. Further, it’s the sort of book that should be required reading in every American political science course. And isn’t. Maxine, you see, was the top madam of Hot Springs, in the heart of one of most corrupt states in the union. It was, to be sure, a simpler period, with gambling and prostitution the lead enablers. By the time Clinton became chief executive, these sins had been replaced by drugs, with the state becoming of the leading importers and with the governor’s prime assignment – as in earlier times – to look the other way. A pilot would tell a reporter that he loved bringing drugs into Arkansas and gave as an example the time he landed in a pasture with his pickup being a state trooper in a marked car. Hot Springs was the southern recreation center for America’s underworld and for those wishing to escape more visible and moral climes. “My guests included local businessman, doctors, and many top officials form the state. “One such official was the attorney general, Beauregard Clochard (his name changed by the author). We did each other a lot of favors during his term in office and he did a lot of special favors for Garland County officials while he Attorney General. “Prominent underworld figures from the East and the West coasts were also among my clientele. . .They’d fly into Hot Springs, go to their hotels, and then hire a limousine to drive them to the Mansion. They always respected me and liked me. They were the best customers I had; they were generous with their money and conducted themselves in a gentlemanly and respectful fashion towards my girls. Maxine was tough and did things her own way, symbolized by the fact that when she was just a prostitute, she steadfastly refused to remove her bra. Most anything else was permitted. |||| There is evidence that many syndicate groups became involved in Hot Springs. Owney Madden was the overseer of everything and watched out for the New York mob’s interests. Morris Kleinman, who was one of the founding gangsters of the Cleveland syndicate spent much time in Hot Springs. It is rumored that the Cleveland boys had pieces of the profits from Hot Springs gambling. Johnny Roselli, an “upper level” member of the Chicago mob was a silent partner in many Hot Springs casinos in the 1940’s and 1950’s, as was Frank Costello. All of these groups used local operators as “fronts”, a system perfected by the Cleveland syndicate in Ohio, Florida, and Kentucky. Since Hot Springs was a very popular tourist spot, the command went out from the different syndicates that there should be no murders carried out in Hot Springs. This would be the rule in Las Vegas too. If bodies littered the streets like in Chicago, it would only hurt business. Also “petty” crimes like burglary and armed robbery were not to be tolerated. If the suckers weren’t comfortable, they wouldn’t come to Hot Springs. Maxine’s troubles – including ending up in prison at one point – were basically those of a local small business operator up against the mob – compromising, paying off, trying to hold her own. And Owney Madden (Oney, she calls him) is mentioned numerous times in her tale. A Clinton is only mentioned once in the book. “Mr Toper, you need a new car. I’m supposed to be the high classed madam of this town and if you’re going to represent me I want you to look like a high classed lawyer. . . Let’s go down to Raymond Clinton’s Buick place and get you one.” And they did, paid for in cash. Raymond was Bill’s uncle. Clinton’s stepfather had been a gun-brandishing alcoholic who lost his own Buick franchise through mismanagement and pilfering. He physically abused his family, including the young Bill. His mother was a heavy gambler with mob ties. According to FBI and local police officials, Uncle Raymond — to whom young Bill turned for wisdom and support — was a colorful car dealer, slot machine owner and gambling operator, who thrived (except when his house was firebombed) on the fault line of criminality. ||||| A relative unknown, he faces an imposing field of rivals in the Democratic primary, and beyond, in the general election, a powerful Republican incumbent. Yet as soon as he enters the race, Mr. Clinton enjoys a decisive seven-to-one advantage in campaign funds over the nearest Democratic competitor, and will spend twice as much as his well-supported GOP opponent. It begins with a quiet meeting at his mother’s house in Hot Springs. Around the kitchen table, as Virginia Clinton will describe the scene, avid young Billy meets with two of his most crucial early backers — uncle Raymond G. Clinton, a prosperous local Buick dealer, and family friend and wealthy businessman Gabe Crawford. As they talk, Mr. Crawford offers the candidate unlimited use of his private plane, and Uncle Raymond not only provides several houses around the district to serve as campaign headquarters, but will secure a $10,000 loan to Bill from the First National Bank of Hot Springs – an amount then equal to the yearly income of many Arkansas families. Together, the money and aircraft and other gifts, including thousands more in secret donations, will launch Mr. Clinton in the most richly financed race in the annals of Arkansas — and ultimately onto the most richly financed political career in American history. Some of the operations were quite complex. Say the syndicate had a rich guy from Dallas who had just lost $10,000. He offered to write a check, but the syndicate would instead fly him back to Dallas accompanied by one of its girls to pick up the money in cash. Liquor would flow as well and, often as not, the gambler would come back with the $10,000 plus more to lose. 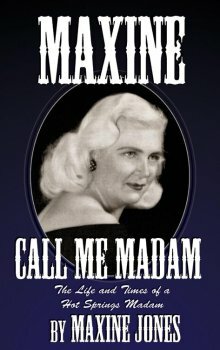 Maxine survived on a strong but attractive personality, bribery, proto-feminism, and blackmail. The fact the Hot Springs was a no-kill zone for the mob probably didn’t hurt, either. I first heard about this distinction from investigative reporter Dan Moldea who had once gotten word in Michigan that, because of his aggressive reporting, there was a hit out on him. He went to the FBI whose agents told him there wasn’t much they could do until he got hit, but that he might think about moving to one of the neutral cities – places that were off limits for mob murders. Hot Springs had fallen off the protected list by then, but Las Vegas, Miami, and Washington were the three mentioned. Moldea moved to DC. Some time late a grand jury was called, but her testimony nowhere as secret as she thought. A microphone had been hidden so that Owney and other mobsters awaiting their turn could hear what she had to say. Maxine even took on the FBI, obtaining Attorney General Bobby Kennedy’s private phone number to ask that he send some clean agents down to deal with syndicate. Kennedy sent a squad to the scene, but the syndicate had already pulled back. Out of prison, she confronted the mayor in his office: “Remember this. If you bother me again, I’ll have that goddamned house of your blown up and your family along with you. Put that in your little hat and think about it. . . By the way, if you ever repeat this to anyone, it’ll get back to me, and I’ll have it done anyway.” The mayor and the cops left her alone. “Most people think prostitution is a dirty business but I can tell you a profession that makes a prostitute look like a Little Miss Muffett in a child’s nursery rhyme book. That profession is none other than politics. . . .
Little did she know that instead, and only a few years later, one of the former, raised and well trained in Hot Springs, would be elected president of the United States. Every political science class should have this book. I purchased the publishing rights to this book in 2008. The orginal version, 1983, was removed from the shelfs by the corrupt politicians and agencies that she spoke about. There were only a few originals and if you were lucky, Maxine, had a book signing in 1995. You could not buy the book, you would have had to had it years before. I opened the brothel as a bad/live music venue in 2005. Sold in 2009. It kept books rights. Hope all enjoy. I am Gabe Crawfords grandson, your facts are very distorted and wrong, I should sue you for defamation of character! And might! If your grandfather, in any public forum, denied offering his plane to the Clinton campaign or having been a bookie, we would be glad to include that in the story. As it stands it is merely a descriptive item that is not defamatory. In fact, your grandfather’s involvement with the Clinton campaign has appeared elsewhere, including the Washington Post. The book we quoted is now over 20 years old and we can find no challenges to the facts it offered. As far as the bookie operation was concerned, this can be found in three books and a PBS interview. We can find no efforts on your grandfather’s part to deny it.